Patented Spirals attract more birds and allow more birds to feed. 9 Seed Ports on Spiral Nyjer Thistle Feeder verses 6 on most others – 50% More! “run the spiral” instead of flying to another perch. Spiral allows Cardinals, Grosbeaks, and other desirable large songbirds to feed. With normal “perch” tube feeders these birds have difficulty feeding without a seed tray. Lifetime warranty on workmanship and normal wear and tear – Aluminum and stainless steel parts. 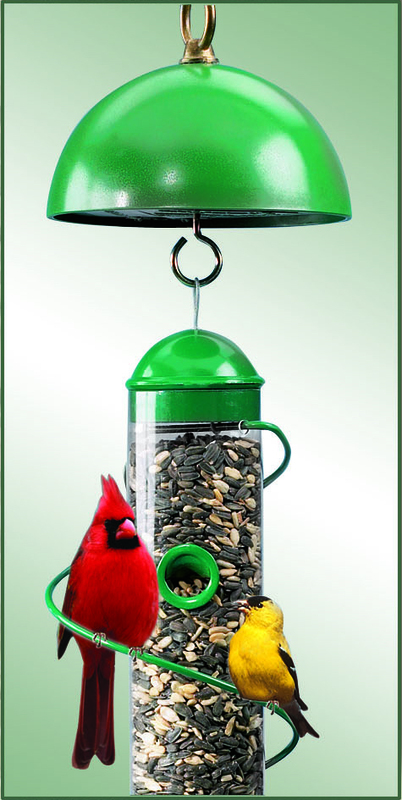 Both Seed and Nyjer Thistle Feeders available in green or aluminum colors. Squirrel-Proof – Patented “Locking Lid” – Just twist and lock those pesky varmints out. Easy-to-clean – “Twist & Clean” (Patent Pending) easy-clean bottom comes completely off for easy cleaning – No screws to mess with. Easy-to-hang – Looped wire hanging cable included (150 lb. test) and attached. Holds cap so you don’t have to wonder where you put it. Easy to attach and unattach - Simply screw onto bottom of BirdQuest™ Spiral Feeder until snug. Clear – Does not obstruct viewing of birds. Drainage Holes – Keeps seed dry.